This 1976 Mercedes-Benz Unimog has everything you want and nothing you don't. Luckily for you, it's goes under the hammer tomorrow, so you still got time. 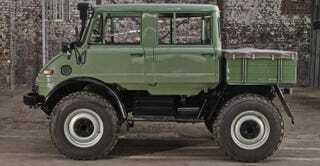 Bonhams is organizing an auction at the Mercedes-Benz Museum in Stuttgart tomorrow afternoon, and this 1976 Unimog 406 Doppelkabine 4x4 Utility might just be the coolest vehicle of the lot. Noteworthy features include a converter clutch; power take-off shaft at the front for additional gear; 'Schmidt' plate to attach further tools (snowplough, front loader, etc); ball-hitch tow-bar; rear luggage platform; Webasto vehicle heater (retrofitted in 1995); front and rear safety belts; and the original speedometer (detached but with vehicle). With its new wheels, tires, and seats that got refurbished some time ago, this five-seater is - there's no other way of putting it - perfect. For more, just head over to Bonhams.